Imagine the ultimate strength training experience…the feeling of lifting “heavy air” rep after rep, set after set, regardless of how much or how little resistance is selected. 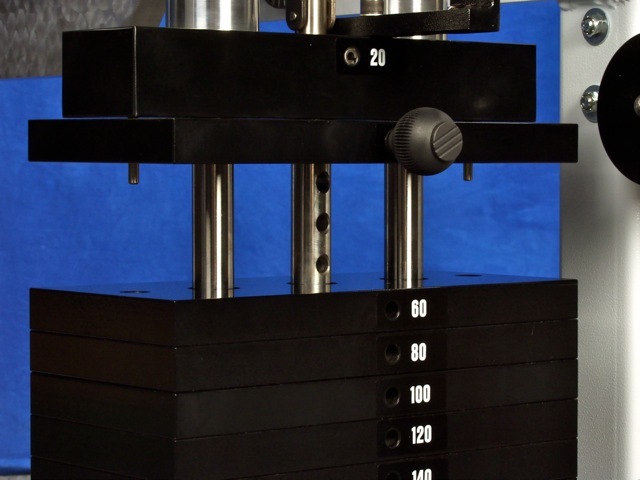 Renaissance Exercise Equipment Ltd. presents the first exercise machines in the world that blend a near frictionless top plate with a pin-indexed, zero-contact, tunable weight stack that floats on air. The patented UltraGlide™ top plate system is the product of a collaborative effort by the associates of Renaissance Exercise to minimize operational friction in weight stack movement. Each UltraGlide™ top plate houses quad linear bearings inside extra long twin chimneys. The entire system moves along robust, one-inch, Class L rails with a level of smoothness, rigidity, and precision unlike anything else in the industry. 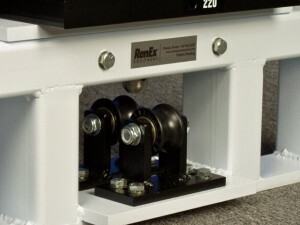 Alone, the UltraGlide™ top plate system is a potent weapon against friction in resistance delivery but RenEx Equipment doesn’t stop there.Enter, the Freedom Stack™. From the creative genius of Ken Hutchins comes a revolutionary new design and technology that solves the eternal problem of weight plate friction. The Freedom Stack™ features indexed pin registry on each plate, zero guide rail contact, and the very first auto-centering tuner for consistent guide system alignment. UltraGlide™ and Freedom Stack™ together form the foundation for superior instruments for human performance that facilitate the ideal protocol for achieving the elusive real primary objective of exercise. We have had over 125 comments on the blog since revealing the new line of RenEx Equipment and for that we are extremely humbled! And this is just the beginning. The first phase of the equipment line is complete but you ain’t seen nothing yet! Please leave your comments below and stay tuned because we are about to release some great content and how YOU can get your hands on these industry changing pieces! Congratulations for these amazing machines that have designed and I want to remember that today marks the tenth anniversary that Mike is no longer with us… but his legacy is immortal in the Universe. None of this ever happens for me if it weren’t for Mike. His writing is still the road map for what we do. I think we will be able to help prove how important his ideals were. 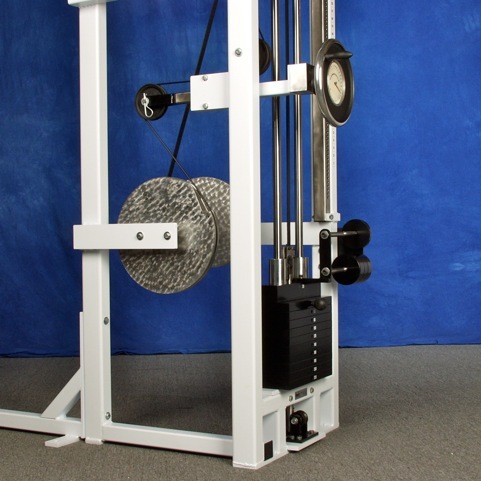 At the same time the weight stack, cam, crank and pulley system look very retro! (Especially the crank and dial indicator). It also looks rigid as hell. Simply amazing!! Thanks for the explanation of the mechanics behind the Ultra Glide and the Freedom Stack. This is definitely light years ahead of anything else that the competition can even imagine. Mike Mentzer once said that nothing in life is static; One is either moving forward, or progressing, or he is moving backward, and regressing. This team is definitely a progressive team. I remember Mike telling me one time that for years he defended bodybuilders, saying they were not stupid or “concrete bound”. But after seeing and encountering many of the Gold’s Gym crowd of overtrained slaves to their passion, he said he may have been wrong in his assessment. If he were here to see what you guys have done, his faith would have been restored. Mike changed my life for the better and we all keep their ideals alive, making incredible machines, teaching HD to others or just writing stories about his life on this website. Joshua & all, I have learned alot from your site. Thank you. I am currently on 2x a wk. 30-40 minutes total. I think Joshua told me awhile back that the closest drive for me ( Clearwater, FL.) was to Altemonte Springs. ( 3-4 hr. round trip w/WO). Hope somebody comes to the Tampabay area soon. Joshua, can you talk a little about that dial thingy on the new machines? I’m guessing it might have some kind of spring in it that as you twist the handle around it puts more tension on a certain part of the movement depending on how strong you are in that position?? Maybe more or less resistance in the contracted position? It is designed so you can accurately time the variable cam precisely to create the most personalized resistance profile possible. The easiest way to explain is that all single joint movements and compound pulling movements will require a reduction in resistance as we get into the end of the positive stroke, once we are getting congested against ourselves we still have tremendous potential for muscular input (contraction), but our output dissipates as much of the work is spent as heat energy congesting against our own body structures, rather than producing greater and greater stroke. 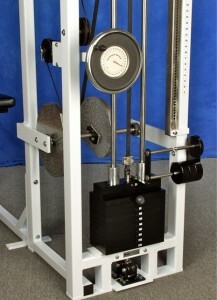 These machines have a positive cam, this cam is reducing the resistance beyond maximum moment arm all the way up to the end of the potential positive stroke. The crank can either advance or retard the cam based on the user’s needs. I.E; On Biceps Curl my biceps will run into my forearm far before that of a very small female therefore my cam needs to be advanced and for the smallest subject their cam needs retarded. You could even retard the cam every rep to accommodate for fatigue . Sounds like these new machines are pretty fricken cool! Just imagine creating an exercise experience in your mind’s eye, describing it to someone and it coming to life exactly the way you expected and then some….there aren’t words to describe how cool this is. 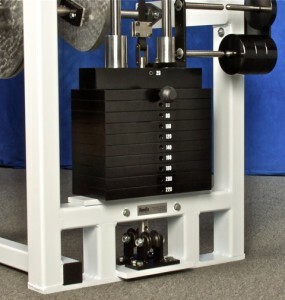 For the life of me I can’t figure out the purpose is of the little rollers in the first picture at the bottom of the weight stack guide? It seems that as soon as the stack is lifted up the center pin guide must seperate away from the rollers? If that’s the case what good does it do? Does it just act as guide to help center the stack after each reps completion? About 17 years ago I found a job at Heartline Fitness company helping the fellow who made their machines in their shop. At the time it appeared to be a dream come true job. Learning how to weld and fabricate cool exercise machines. In fact I was told I could make any machine I wanted to take home in my spare time and they got lot’s of Nautilus in as trades as well. Well after I worked there a few months I realized the toxic fumes from the welding and paint etc were not being ventilated well out of the building and I was heading towards miners lung . They wouldn’t rectify the situation so I had to quit to protect my health. Here I was trying to improve my health with these machines and yet the atmosphere was killing me. I found it was just easier to use a machine someone else had made.Of course it took me 30 years to get them, ha ha…Now I just stick to minor modifications.